Totally expected whitewash from Khamenei. Yet there is opposition reported in the clerics’ ranks. Lead cleric and former Iranian President Ali Akbar Hashemi Rafsanjani, a Moussavi supporter, may play a pivotal role. 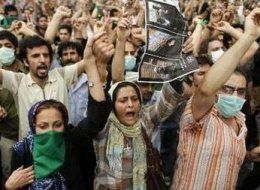 Despite Khamenei’s threats, the demonstrations are continuing. This isn’t over by any extent. This entry was posted in Iran, journalism, news, Politics, Uncategorized and tagged Huffington Post, HuffPost, IranElection, livebloggin, Tehran, video, world news by allenshadow. Bookmark the permalink.